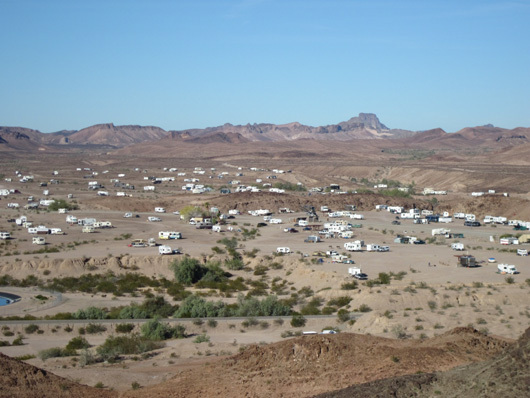 There is a military RV park named Desert Rats at the Barstow, CA Marine Corps Logistics Base. This isn't that. I'm just borrowing the term as it's used to describe folks who live in the desert, even if it's just for the winter. 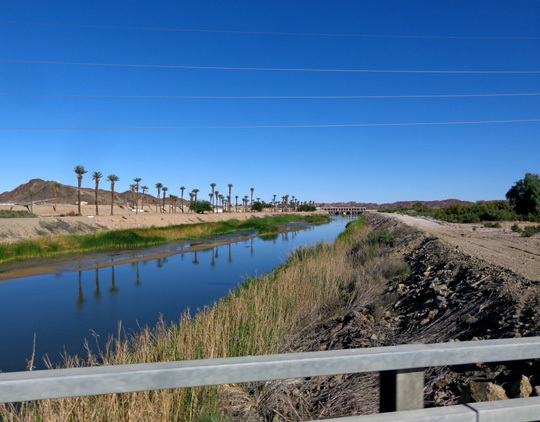 With all the agricultural irrigation along the river north of Yuma it's a wonder there is any water left in it when it gets to town! 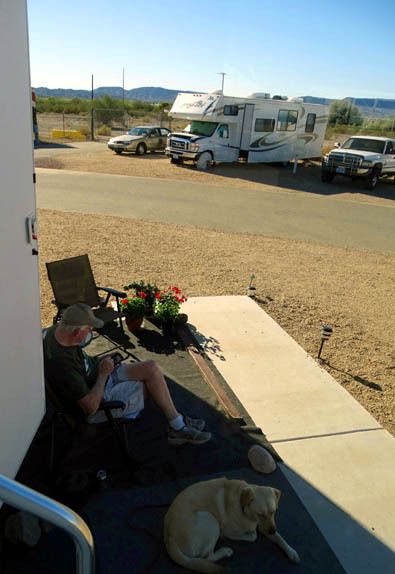 Four winters ago we spent a little over two months at the nearby Imperial Dam Long-Term Visitor Area (LTVA), a 5,000-acre chunk of BLM land on the California side of the river where several thousand other RVing snowbirds from all over North America came to bask in the warm winter sun. The cost was dirt cheap (pun intended) and we had about an acre to ourselves but it was a lot of work to haul and dump water, etc. with no hookups. We aren't getting any younger. These days we prefer to have water, electrical, and sewer hookups, as well as reliable phone, internet, and TV connections, especially when we're in one spot for several months. 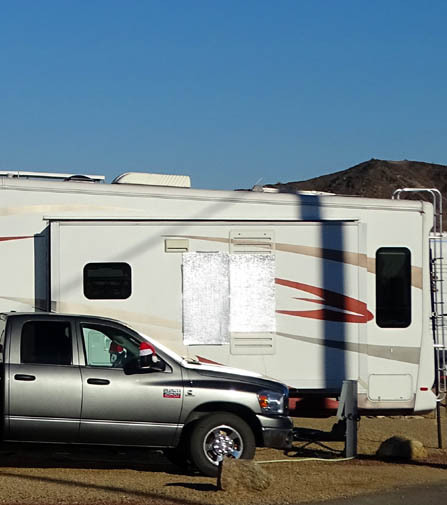 So this winter we decided to try out the nice RV park at Yuma Proving Ground, just a few miles east of Imperial Dam LTVA. We drove on-base several times when we were a few miles away four years ago to ride our bikes around the cantonment area (mostly housing and services, not secure work areas), do laundry, check out the heritage museum, and use some of the other facilities -- so we already knew what the campground looked like. RVers settled in yet in late October. The older section has more trees but smaller sites. 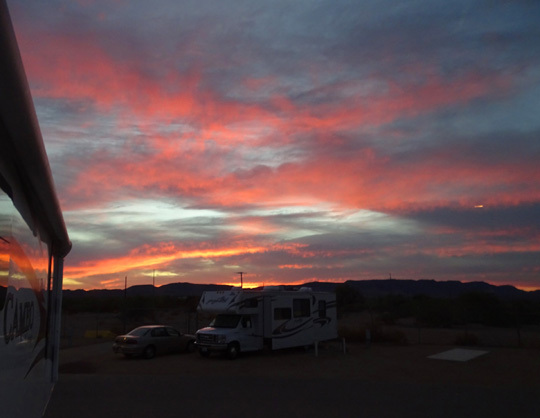 At just $375/month for full hookups, cable TV, and "free" WiFi, Desert Breeze RV Park is a real bargain. It's less expensive than any other military travel camps where we've stayed and has some features that even more expensive ones don't have. 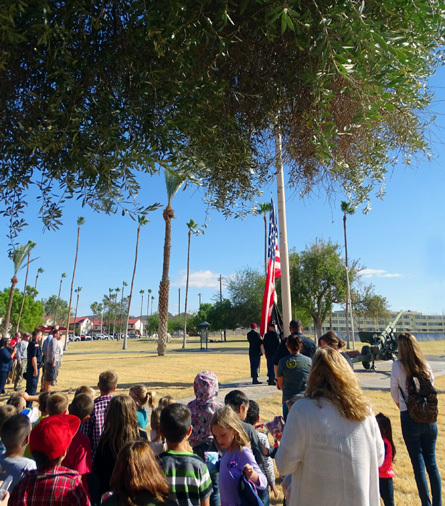 YPG doesn't have very many personnel living on base (most live in Yuma) so services like the commissary and veterinary clinic are more limited than most bases. 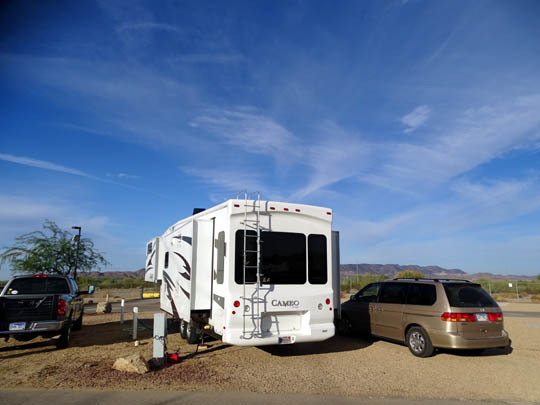 This stay turned out to be our longest in one place in the twelve years we've been traveling in our RV -- October 25, 2015 to March 20, 2016, almost five full months. It's not that we loved it that much at YPG or got inertia. In fact, we were pretty tired of brown desert by the time we left. We timed our departure because of weather considerations in the places where we wanted to go next in the spring of 2016. 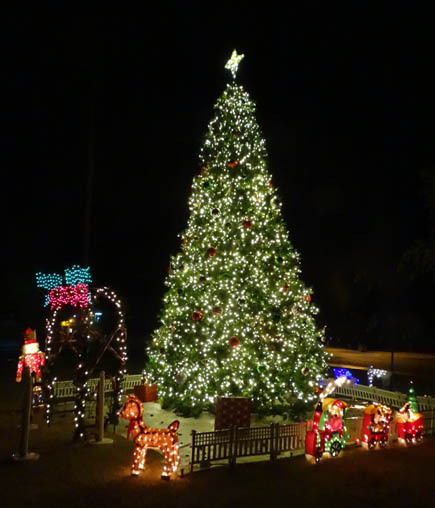 This entry covers information about YPG, camping at the RV park, and some of our activities on base the last two months of this year. I'll have three additional entries about our hiking and cycling adventures in this area, more photos from produce fields and orchards, a tour of one of the local date farms, and visiting the only colorful desert locale we've found down here, the Imperial Wildlife Refuge. 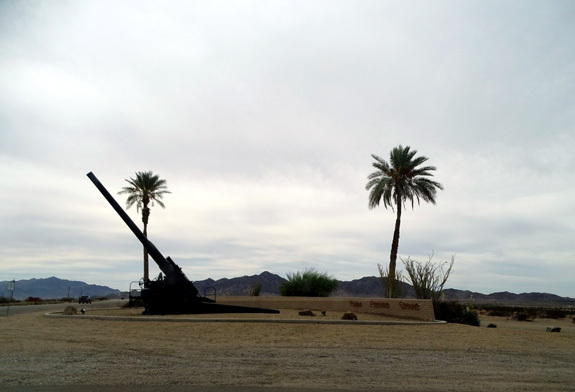 It was a relatively short drive on October 25 from Black Canyon City, AZ to Yuma Proving Ground via I-15, a bypass around the west side of metro Phoenix, I-10 west, US 95 south, and Imperial Dam Road. Heading south on US 95 through Proving Ground territory; lots of jagged peaks in this desert. Sign for YPG at intersection of US 95 and Imperial Dam Rd. Because it is the "proving ground" for Army personnel, tanks, artillery, and other equipment, YPG covers a LOT of desert territory -- well over a thousand square miles. Most of the military property is either roadless or closed to the public but anyone can drive through the parts of the base on US 95, Imperial Dam Road, and the road to Martinez Lake and the Imperial Wildlife Refuge. 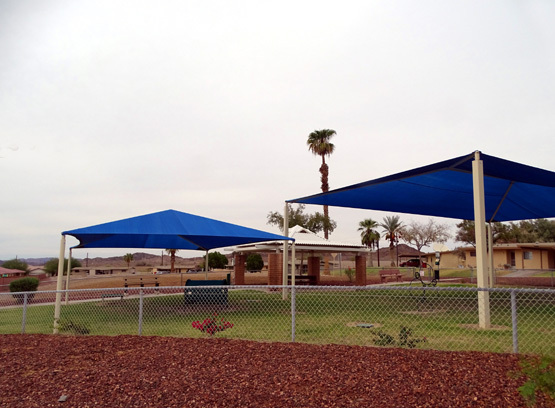 The secure entrance gate for the cantonment area, which includes Desert Breeze Travel Camp and base housing, is about six miles west of US 95 on Imperial Dam Road. Although the public is allowed through this gate to visit the heritage museum or attend church and some special events, most of the time only people with military IDs can get on base. Even with military IDs Jim and I can't access any of the working/testing areas, though. 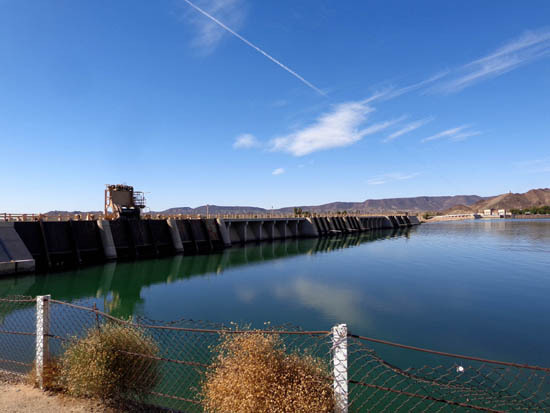 The Army first began using this location along the Colorado River at Imperial Dam during WWII. Because engineers could control the flow of the water, they were able to test the construction of portable bridges used elsewhere in the war. river and an interpretive sign that tells the history of the portage bridges. General Patton also used the vast surrounding desert to train more than a million soldiers for combat. After the war ended the Army has continued testing combat vehicles, aircraft, and weapons systems, as well as personnel. It is one of the largest military installations in the world. It is also home to the Military Freefall School and GM's hot-weather test track. With proper identification (vehicle registration, proof of insurance, and photo ID), the general public can visit the YPG Heritage Center via the same gate on Imperial Dam Road that is used to reach the RV park. The museum has exhibits about the history and mission of the base from the 1940s to the current day. 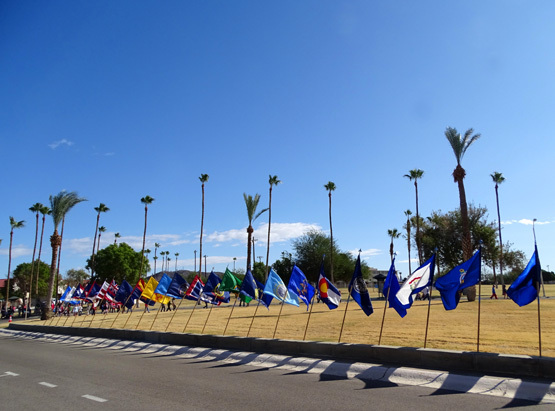 There is also a Marine base in Yuma which offers more veteran and retired military services. 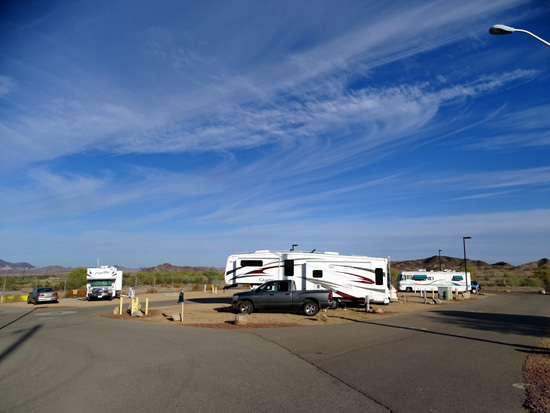 Desert Breeze RV Park is relatively quiet, considering all the activity occurring at this base. Sites are open to military active duty, National Guard, reservists, retired, 100% disabled veterans, DoD civilians, and their guests. Jim and Casey begin a bike ride on base (that's our Cameo behind them). 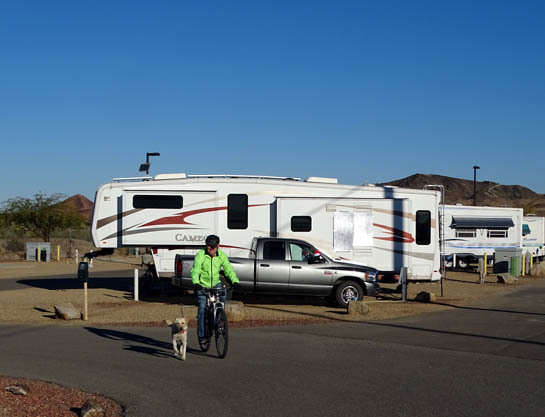 Although some folks reside in their RVs at Desert Breeze year-round for their jobs on base, most of the sites are used in the cooler winter months for recreation purposes, not base housing. 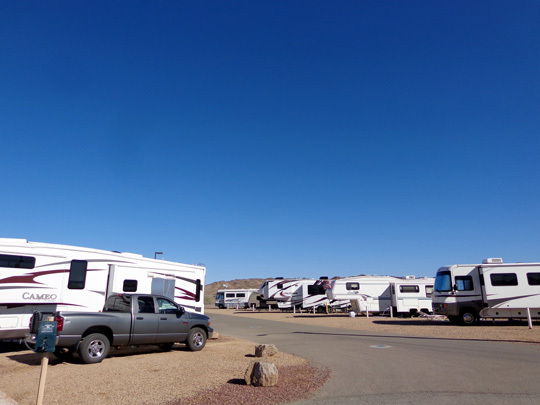 There is another smaller RV park on base for personnel living here temporarily or waiting for housing to become available. Reservations are not allowed in most cases** so we called periodically before our arrival to make sure there were some spots available. We were advised that the seasonal sites would probably fill by mid-November, so we got here earlier to have more choice. ** A quirky exception is for snowbirds who are adamant about getting their previous winter site. They can pay for both Sept. and Oct. to reserve it, if available. the distance. This area gets an average of only 3" of rain annually and has 350 days of sunshine. 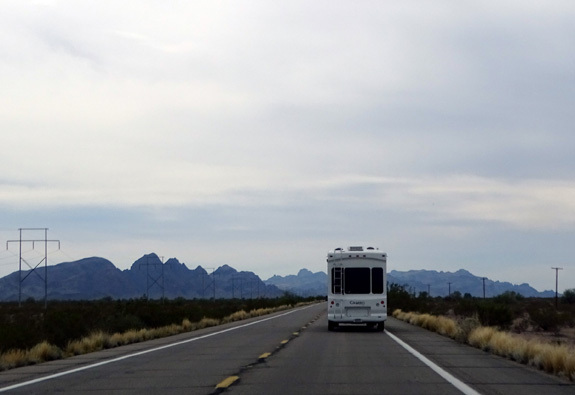 A few sites, including two with only water and electricity, are designated for RVers wanting to stay for shorter periods of time. This year the daily rate is $30 for full-hookup sites with 50-amp electricity, water, sewer, WiFi, and cable TV. The weekly rate is $130 and the monthly rate is an unbelievably low $375. That's only $12.50/day! 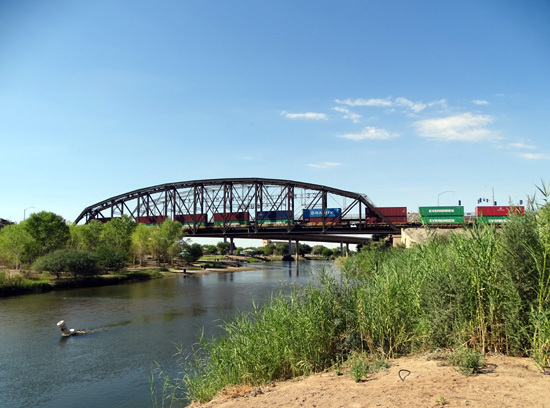 By staying five months, we were able to save a lot of money even though we drove about 25 miles each way down to Yuma once or twice a week to shop and run errands. It's nice having the car to use for those trips so we can save on fuel costs. The row behind us was full by mid-November but a few other sites were still available. Before we headed for YPG we looked at Google Earth photos of the RV park to try to determine how and where we'd want to be situated. Jim and Casey enjoy some shade on our patio before the sun moves around there. 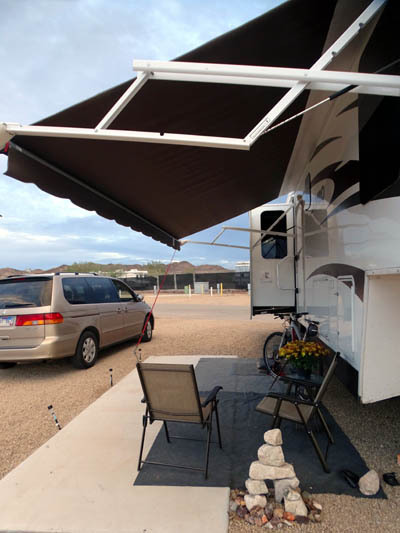 We seldom used our awning, even with tie-downs, because of too much wind. When we arrived on October 25 our first choices were already occupied by seasonal guests but about 80% of the full-hookup sites were available. That still gave us lots of options. It's a pain to move a 5th-wheel from one site to another so we found what we hoped would be a suitable site in the farthest loop and stayed put for five months. Our large pull-through site at the end of a row has plenty of room for the Cameo, truck, and minivan with no one on our off-doorside, which faces SE. 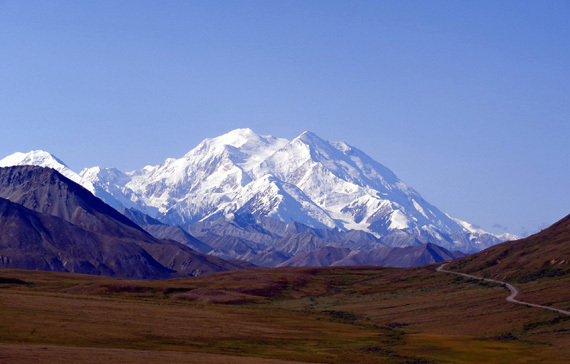 It has been very quiet on the farthest loop, we have interesting views of the hills to the north, and the WiFi, phone, and TV signals are strong. and too much sun on the other side for the refrigerator to operate properly when we first arrived and temps were still in the 80s and 90s F.
In late October we were one of the first to occupy a site in the far back loop. By the end of November it was mostly full and remained so until March, when folks began heading north because it was starting to get hot again. I also built a little Inukshuk with colorful rocks I found during hikes. Canadians use these people shapes as cairns on trails and I just like them. 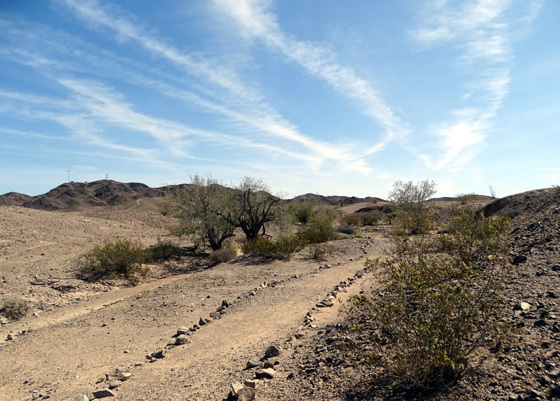 The desert floor and mountains in far southwestern Arizona are mostly brown, with less color and fewer green plants than the deserts near Phoenix and Tucson. 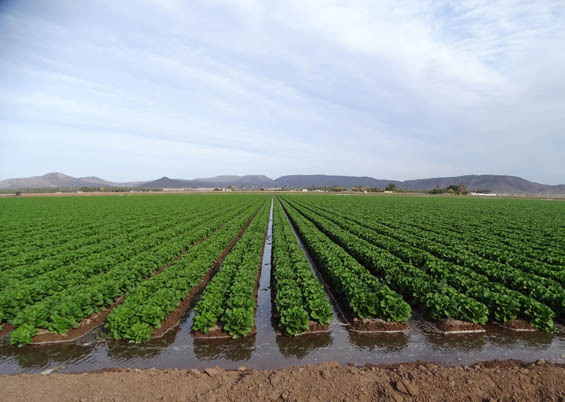 The most color is found in the beautiful green fields full of vegetables and some cacti that bloom in the spring. 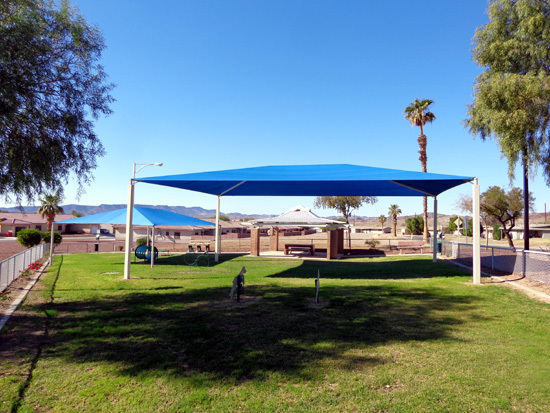 Desert Breeze has a large activity building housing the campground office, large spaces for lounging and potluck dinners, a game room, and mailboxes. Each site has a designated slot in a room next to the office for USPS mail, which is convenient. Private carriers like UPS and FedEx deliver packages directly to our door -- even nicer! We had a bit of a problem when REI sent a new bicycle seat via a different carrier we'd never heard of. The delivery guy didn't have proper ID to get on base but we eventually got the package. 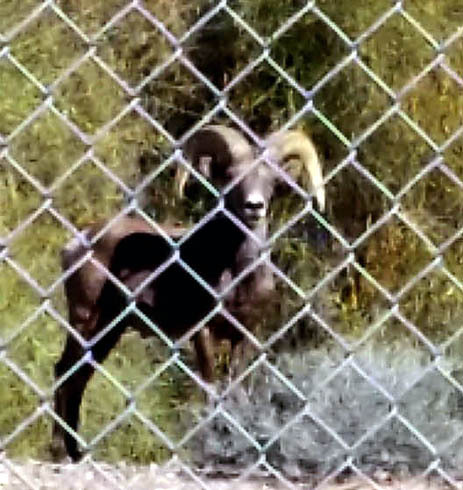 sheep (below) next to the fence surrounding our part of the RV park. 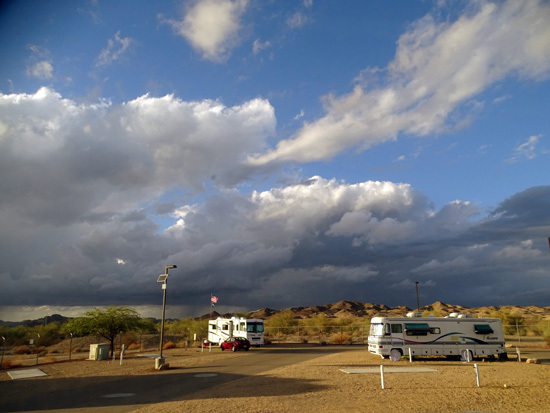 Campground residents also have access to a large laundry room with showers near the center of the campground. All the washers and dryers are usually in good working order. 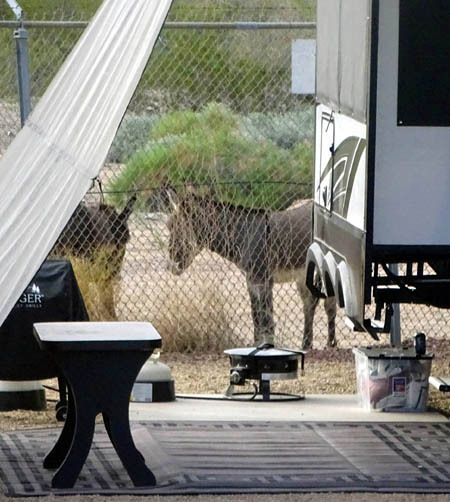 They aren't free like at some military RV parks but the cost is much lower than a commercial Laundromat. There is an additional laundry room in the building housing the NEX shoppette and fuel station. We used that when we camped at the LTVA four years ago. Note that there is no diesel for visitors in this area on base, just gasoline and propane. 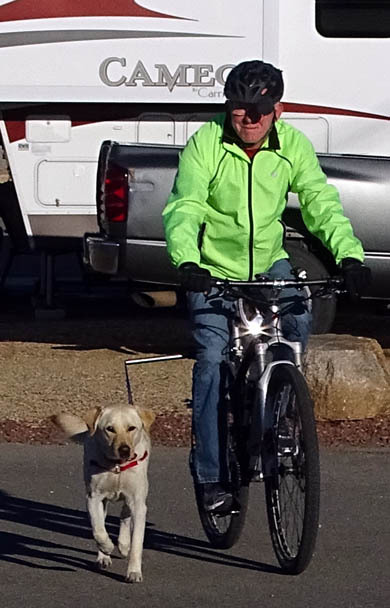 Although the part of YPG to which we have access is smaller than some other military installations where we've stayed, there are several miles of paved streets that are safe for us to ride our bikes and walk the dogs. with the "Walky Dog" attachment. housing area and by the library. 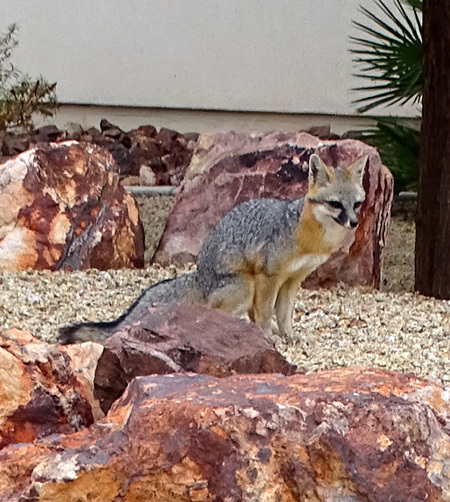 Coyotes also roam the surrounding hills. Because of base security I'm limited in what photos I have been able to take even in the cantonment area so I'm using a lot of discretion in what I'm showing here. and through Cox Field, a large grassy area with ball fields. There isn't much grass in the desert! We found different things to look at on nearly every walk and ride on base. The train was developed in the early 1960s to transport troops, supplies, and equipment slowly for up to 400 miles both on and off-road, including rough, uneven terrain. 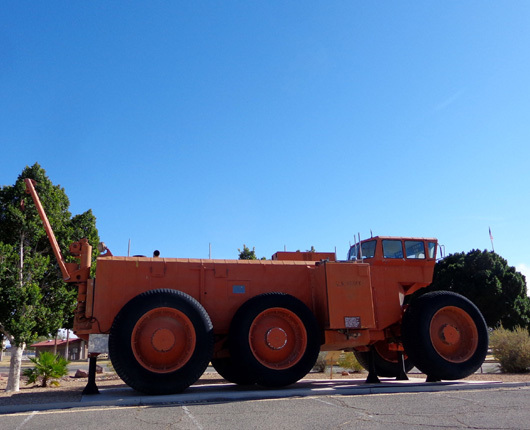 The control car shown above could haul ten cargo cars and two power-generating cars, as well as provide living quarters for six crew people inside. It's very convenient to just walk right from our campsite and not have to drive somewhere, although we do that for variety almost every day, too. The next entry will have photos from other nearby places where we hiked and rode our bikes.